Dog meat farmers staged a protest near the National Assembly on Wednesday, calling for equal treatment as other animal farms and demanding survival rights. 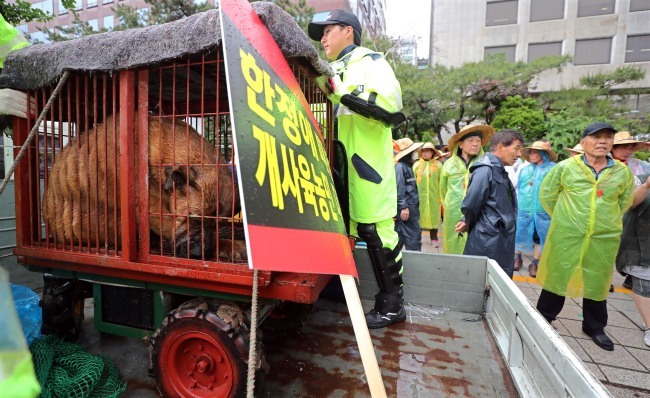 Some 200 members of Korea Dog Farm Council members took to the streets in front of the ruling Democratic Party of Korea headquarters in Yeouido, Seoul, and demanded the lawmakers introduce a grace period for dog farms to install excreta treatment facilities. In February, the National Assembly passed a revision to the Act on the Management and Use of Livestock Excreta, mandating animal farms operating without permits to install excreta treatment facilities. While all farms were given a grace period of six months, dog meat farms were subjected to the law immediately when it went into effect in March. At the rally, the meat farmers also brought five dogs in cages, as they intended to show the differences between “pet dogs” and “dogs for meat.” They also strongly denounced Rep. Han Jeoung-ae of the ruling Democratic Party of Korea, who is the head of the parliamentary environment and labor committee that reviewed the livestock bill. Animal rights activists were also present at the scene, and they clashed with the farmers as they sought to rescue the five caged dogs. Two farmers were arrested at the scene. One was caught after throwing filth toward the animal rights activists, while another was arrested for throwing the police line. The police said it dispatched 400 officers around the protest.